Home Posts Tagged "Wart Removal"
Warts are provoked by various strains of human papillomaviruses (viruses which causes warts). Various strains may cause warts in various parts of the body. Warts can be spread from one area on the body to another or from person to person by contact with the wart. Warts on hands which is a very common phenomenon. Flat warts which appear on the face and forehead. Plantar warts which usually found on the bottoms of the feet. Warts under or around the fingernails and toenails. Oftenly, warts may disappear by their own but it takes many years to go away. The treatment of warts is essential because common warts can bleed and painful. You may feel embarrassed if they grow on your face. When you take treatment, most importantly it diminishes the possibility of spreading to other areas of your body or to other people. It is highly advised that don’t try home medications or over-the-counter drugs to eliminate warts on the genital area because you could hurt your genital area but if you want to remove warts by your own, then it is recommended to take help from a proficient doctor for warts removal treatment. You can apply salicylic acid for the treatment of warts on hands, feet or knees. After taking bath, tap your skin lightly with a towel and put salicylic acid on your warts. The acid soaks in deeper and works better when it is applied to damp skin and by the next day remove warts with the help of emery board or pumice stone. To get good results, you should use the acid every day for many weeks. Doctor use cantharidin to treat your warts. In this treatment, the doctor applies the chemical onto the wart. After application, you will undergo some pain and blistering of the wart in about 3 to 8 hours and after that, a bandage is put over the wart and can be removed after 24 hours. Your doctor can use cryotherapy or cryosurgery which uses liquid nitrogen to freeze the wart. Utilizing liquid nitrogen to the wart causes a little discomfort. The liquid nitrogen treatments may be required every 1 to 3 weeks for a total of 2 to 4 times. A doctor may treat warts by burning the wart, cutting out the wart or removing the wart with a laser. These are the effective treatment but may devise the scars. 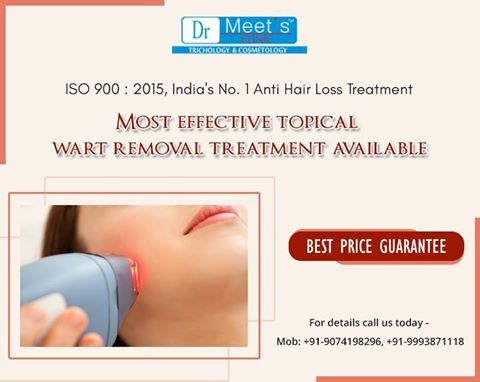 For wart removal, feel free to contact Dr. Meet’s Clinic, we have been providing wart removal treatment for past many years and have experience of removing all types of warts from various body parts. Many people with warts have a number of questions about the best removal methods. Most people with warts also have questions like, what causes warts, are they contagious and how they can be prevented? Here in this blog post, we will answer these questions, as well as provide you with safe and effective methods to remove your warts. Warts are caused by a virus called as the Human Papilloma Virus (HPV). There are many forms of this virus, (HPV) and the different forms are usually responsible for the different types of warts that appear as growths on the skin. The different types of warts include flat, plantar, common and genital warts. Warts are definitely contagious, and occur when the virus comes in contact with the skin. This virus is most likely to enter your skin in a place where the skin is broken, like through cuts or scratches. It is still unknown why some people are more prone to warts than others. However, it is known that children are a lot more likely to get warts as compared to adults. This is because their immune system hasn’t yet built up their defenses. If you have warts or someone in your home has these, you should avoid sharing the same towel or bathmat that the person with wart uses. Warts can also spread from one part of the body to another. So, you should avoid touching any of your body parts after touching the wart. While you can’t prevent warts from occurring, there are many ways a person can take to reduce the risks of getting warts. As warts are caused by a virus, one easy method of prevention is washing your hands regularly. It is also important to keep your skin cuts free and healthy. Avoid sharing towels or bathmats in public locations like gym and when showering in public locker rooms always wear flip-flops. The best wart removal technique is to consult an expert like Dr. Meet’s Clinic. There are many home remedies as well for this process, but they are not as effective, also they take time and you could injure yourself with severe damage if you try to remove wart by yourself using a sharp object. For wart removal, feel free to contact Dr. Meet’s Clinic. We are experienced and specialize in removing warts from various body parts. Dr Meet’s Clinic is a India’s most advanced,trusted and reliable clinic in the field of Trichology & Cosmetology Dr Matganjan Dwivedi & Dr Babita Dwivedi has combined 20 years experience in pan India. Now we carried highly advanced and scientific line of Australian treatment for your hair loss trouble & world class spanish, laser system for permanent hair and tattoo removal . Copyrights © 2018 : Dr. Meet's Clinic | All Rights Reserved.